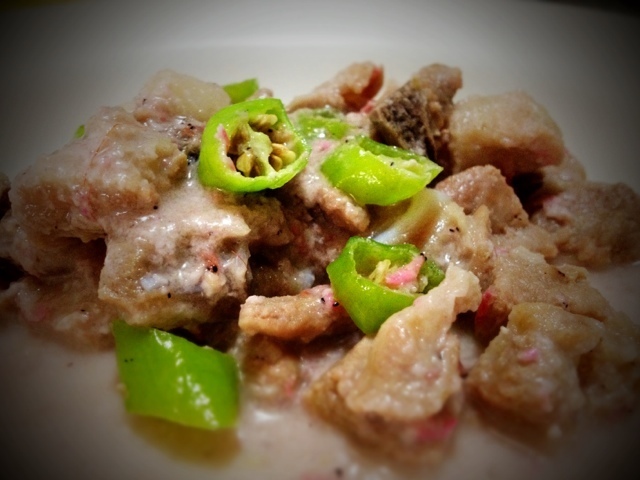 Bicol Express is a popular spicy dish from the Bicol Region – known for its spicy and cooked in coconut dishes. My son and I love eating spicy food while my daughter does not, but she enjoys anything that has coconut milk. So, I made 2 versions of Bicol Express: spicy and not spicy. Here’s my version of the spicy variant. 1 kilo cubed pork shoulder or liempo. 2 pieces finger chilies. Diagonally sliced. 1. Boil pork until tender. Set aside. 4. Add bagoong alamang (shrimp paste) and chopped finger chilies and stir. Save some finger chilies for garnish. 5. Pour in coconut milk (2nd extract). Simmer. 6. Add coconut cream (1st extract) and bring to a boil until consistency thickens. 7. Add a little salt and pepper to taste. 8. Garnish with fresh finger chilies. Note: Just remove the chili from the mixture for the non-spicy version. wow bago yan ah pero me i don’ t dare swallow a saotnl seed my father kasi use to scare us that this will grow in the intestine kaya careful ako not to swallow it. True na talagang delicado a friend of mine name Erma was operated and has her colostomy for two years due to excessive swallowing of saotnl.